Q Acoustics M7 review | What Hi-Fi? You don’t always need large dimensions to be powerful and a first listen to the Q Acoustics M7 is certainly proof of that. A 2.1 sub-sat package, the M7 incorporates two satellite speakers and the sub from the Q7000i 5.1 package, which we described as a 'substantial leap forward in music and movie sound quality', and pairs them with the new Q-AVA compact stereo amp. It’s an interesting setup that angles itself at both a TV audience, and one looking for a powerful stereo setup without the bulk. The small satellites remain unchanged from what we’ve seen before, each pill-shaped unit standing just 24cm tall and packing two 75mm long-throw mid/bass drivers and a 25mm tweeter. The speaker terminals are hidden in the base, which also swivels around to allow you to wall mount them should you wish (though this is more likely to be of use in a 5.1 setup). The sub is the only sizeable part of the M7 package, and boasts a 20cm bass unit supported by a 150W Class D amplifier. Its uses Q Acoustics’ own Internal Firing design, which blasts the bass against a sounding board to deflect it evenly into the room. The upshot here is that it is less fussy about where you position it. The heart of the Q Acoustics M7 package is the new Q-AVA stereo amp, which at just 17.5cm wide, won’t demand much rack space from you. The connectivity options are modest too, focusing on two optical inputs (which support files up to 24-bit/192kHz), a single 3.5mm analogue in and aptX Bluetooth, but goes big on power, with a quoted 50W per channel (into 4 ohms). Inputs can be chosen and monitored via the simple front panel (or indeed using the included remote), with the selected input lit up with a blue light. The volume controls get a similar treatment, with an arch of blue LEDs moving up and down with your commands. The final button on the front panel is the MoviEQ button, which aims to give the bass a boost for when you are watching movies. Setting up the M7 is relatively straightforward. We place the speakers on stands, slightly toed-in to our listening position and put the sub in the middle on its spikes. We would recommend you don’t use the included spike protectors, however, as using them has a dampening effect on the sound. If you need to protect your flooring, try placing a coin under each spike instead. We keep the phase settings at 0° by placing the sub horizontally, with the grille facing towards the back – if your set-up requires you to place it differently, you’ll just need to ensure you switch the phase settings to 180° instead. The Q-AVA amp has a high-pass filter set to 125Hz, so we set the crossover to match and turn the level to a few notches below halfway and we’re ready to go. We first decide to give the Bluetooth functionality a try and load up Tidal for some high-quality streaming. The first thing that strikes us about this little system is its sheer scale and power. It’s seriously impressive just how big a sound it’s capable of, and one that’s spread across a broad soundstage too. We play Waves by Kanye West and the stirring choral loop that forms the song’s base fills our test room with plenty of headroom to spare. There’s real space between the instrumental and vocal tracks too, with a great stereo image that stretches itself in front of us in an expanse of sound. There’s great clarity here too, with no parts of the frequency range muddying others with influence. This is partly down to the great sub integration, which passes lower frequencies between sub and speakers seamlessly. It goes low too, with real weight and impact behind every drum kick. There could perhaps be a touch more punch there, but detail-wise it’s decently textured, and provides real solidity to the sound. 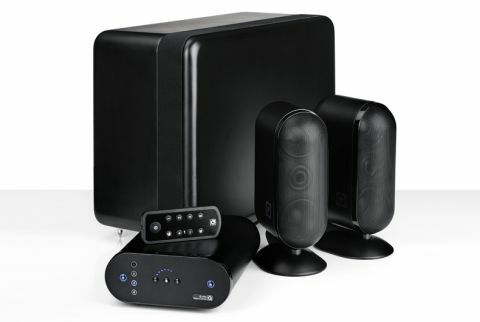 It can’t manage to dip to the sub-bass rumble of James Blake’s Limit to your Love, but that’s a tough level of bass for any system to get right at this price – it’s much more comfortable and expressive a little higher up the frequency range. It’s fast and agile bass though, and that character continues all the way up the frequency range, with an up-front and exciting sound that’ll take on even the most complicated of rhythms. We take a listen to Toxicity by System of a Down and the M7 doesn’t hold back here either, managing to balance drive, organisation and timing in a way that neither sounds unruly or overly precise. The choruses are big and dramatic, and the M7 manages to deliver on that, while still ensuring the accompanying frenzy of guitars and drums falls head-bangingly into line. We would like more expression throughout the mids and treble though, which aren’t as detailed as we’d like. Voices lack the level of insight you’ll hear on the best systems – the Q Acoustics M7 tends to gloss over the subtler nuances, while the treble doesn’t always sound as natural as it should. A stream of Mozart’s Moonlight Sonata lays this bare. There's not quite enough detail in the treble to give a realistic sense of depth and texture to the piano notes as they’re played, leaving them sounding more like a keyboard than a real piano. A stream isn’t the best source to judge a product on though, so we switch inputs to the optical and use the Cyrus CDi to try out some CDs. We put on The Diary of Alicia Keys and play You Don’t Know My Name. There’s certainly more detail and expression delivered than via Bluetooth, but it still feels lacking in absolute terms. It’s a musical listen, and the scale and solidity in the M7’s arsenal feels greater still, but when it comes to listening more critically, we just want it to tell us more. This is evident with another piece of piano music, Gymnopedie No.1 by Erik Satie, and though it offers more dynamics and gives the piano a more full and natural sound, it’s still not explicit as we’d like. We decide to try the Q-AVA amp with our reference ATC speakers to see how much of this is down to the amp, and we’re greeted with a very similar sound. There’s still drive and scale to spare, even with speakers much bigger than those the Q-AVA is made for, but we don’t feel like we’re being told much more through the midrange and treble than we are with the small Q7000is. The amp just needs a subtler touch to make this happen – it puts a large, open and impressive sound front and centre, but could do with a bit more focus on the small stuff to be a really complete package. Use it with your TV, and there’s no doubt the Q Acoustics M7’s bold character will work in its favour, delivering a bigger, wider and more open sound than most soundbars at this price. The MoviEQ button is a cinema equalisation setting that aims to push this further still, pulling back the treble and boosting the bass by about 4dB. This results in more oomph behind explosions and action scenes. It certainly dishes out more bass with it switched on, but it loses some of its detail and tautness in the process. We prefer to keep it turned off – there’s plenty of solid bass as it is – but if you want more impact, try it out. Just make sure you turn it off for music, as it tips the otherwise well-balanced sound strays a little into ‘too rich’ territory. The Q Acoustics M7 is a desirable little package at a good price, delivering a huge sound from a small system that should fit into most home set-ups. It’s an impressive and entertaining sound, but that lack of transparency in the midrange and treble does knock our initial enjoyment for the system when we sit down for a more critical in-depth listen. It’s hard to know exactly what the competition is for the Q Acoustics M7. If it’s a soundbar or all-in-one solution, a bigger, more open sound with a wider soundstage is a given here (with a few more wires to hide), while a pair of active speakers like the Dynaudio Xeo 2 deliver more on the detail and dynamics, but can’t match the M7 for scale. The Q Acoustics M7 is an interesting and flexible proposition then, but unfortunately it’s not flawless. If you’re looking for a big, enthusiastic sound without the bulk, we’d still thoroughly recommend giving the M7 an audition. However, if it were to take pride of place in our home, we’d need more expression to keep us really entertained. It is for this reason we can’t give it the full five stars.